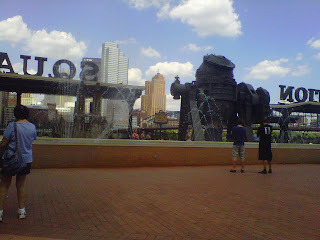 -Friday night, taken at the "water steps" on the North Shore by PNC Park. I'm on the left and my roommate Heather is on the right. Coordination was not planned. -Saturday afternoon at Station Square. This was taken at the "dancing waters", which light up and puts on a show to go along with music. Favorite with tourists! -Saturday afternoon at the Duquesne Incline. -Again from Mt Washington, further down the road. 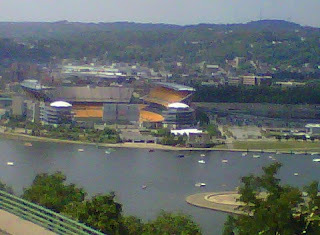 This is Heinz Field where the Steelers play! I apologize for the terrible picture quality, these pictures were all taken with my phone!